Signup closes 3 hours prior to the event. Event Time: 7 PM PDT / 8 MDT / 9 CDT / 10 EDT. This 120 minute webinar will be a whirlwind of panoramic goodness. We will cover everything from the gear to how it is set up and used to the final stitching of the photographs. 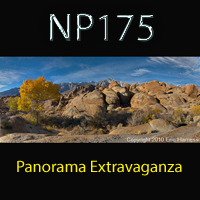 By attending this webinar you are also eligible for a discount on my panoramic software of choice. Oh and freebies don't forget about those. Intro into the basics methods to help you hit the ground running. Hints, tips and techniques for improving your photography. Can it be more fun? Notes are includes for free when you register.